I’ve always felt that the title hurt the collectibility of this book. ‘The Shield’ would have worked better. In 1959 DC Comics’ push to re-establish the dominance of superheroes in comics was off to a good start. Flash had been successfully re-introduced and makeovers to heroes like the Atom and Green Lantern were only months away. To their credit Archie got wind of the momentum shift back to superheroes very early and asked Joe Simon and Jack Kirby rebooted the Shield, a defunct Golden Age hero that first appeared in Pep Comics #1 (Jan. 1940). Their final product was The Double Life of Private Strong. 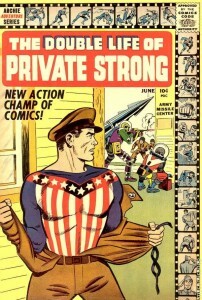 The Double Life of Private Strong #1 is more important though for introducing the Fly. The Fly was an instant success and in August 1959 earned his own title. The title was called the Adventures of the Fly. 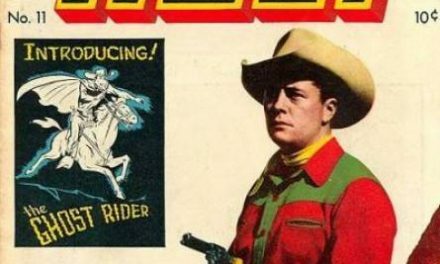 Looking back, the title was very aggressive in re-introducing other MLJ (the publisher’s name in the 1940s) Golden Age heroes including, Hangman, the Comet, the Shield and Black Hood. The Fly-Girl character was also created in the pages of Adventures of the Fly. Years later in 1965 Archie Publications created the Mighty Crusaders in their attempt replicate the success of Marvel’s Avengers and DC’s JLA. The Mighty Crusaders consisted of The Fly, Fly-Girl, the Comet, the Black Hood and the Shield. 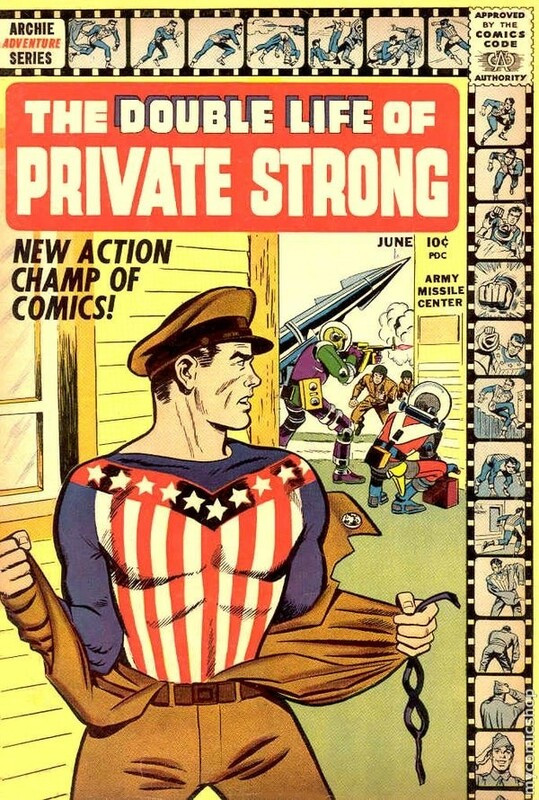 The Double Life of Private Strong launched a good two and a half years before Stan Lee at Marvel tried his luck at resurrecting the superhero genre (he also solicited the help of Jack Kirby). So why did Marvel succeed and Archie fail? Did Archie jump in too early? Should they have let DC solidify things more with their later successes of Atom, Hawkman, the Justice League and Green Lantern? Or did they just not create the superhero stories people wanted to read? Whatever the reason history has shown that Archie’s foray into superheroes was not successful. The Double Life of Private Strong deserves recognition, respect, consideration and demand though for what it attempted. The 40th edition of the Overstreet Price Guide shows $360/$673/$985 as the splits at the 8.0/9.0/9.2 grades. PreviousThe first complete Thor trailer. Watch it and get excited! Some great stories there: recently reprinted beautifully in Simon & Kirby Superheroes. Don’t ask and don’t tell soldier!